The candidates are lining up in the race to succeed Theresa May as next leader of the Conservative Party and – barring yet another General Election – Prime Minister. 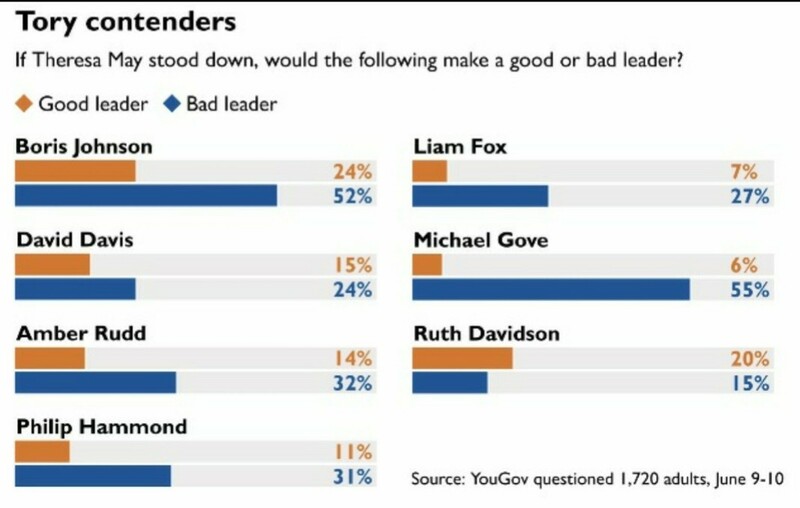 They range, as can be seen, from the fantastically toxic Michael Gove to the public’s choice, Ruth Davidson. The race looks certain de facto to be a third – in the space of little over a year – referendum on the nature of our future relationship with the EU. The procedure whereby the leader is chosen is set out in Schedule 2 of the Conservative Party Rulebook. Broadly, if there is more than one candidate – and after the disaster of Theresa May’s premiership it is hard to imagine another act of anointment – MPs narrow that number down to two candidates and members then make the final decision. Which members get to make the final decision? Well, Schedule 2 Rule 5 (see above) sets out two criteria. 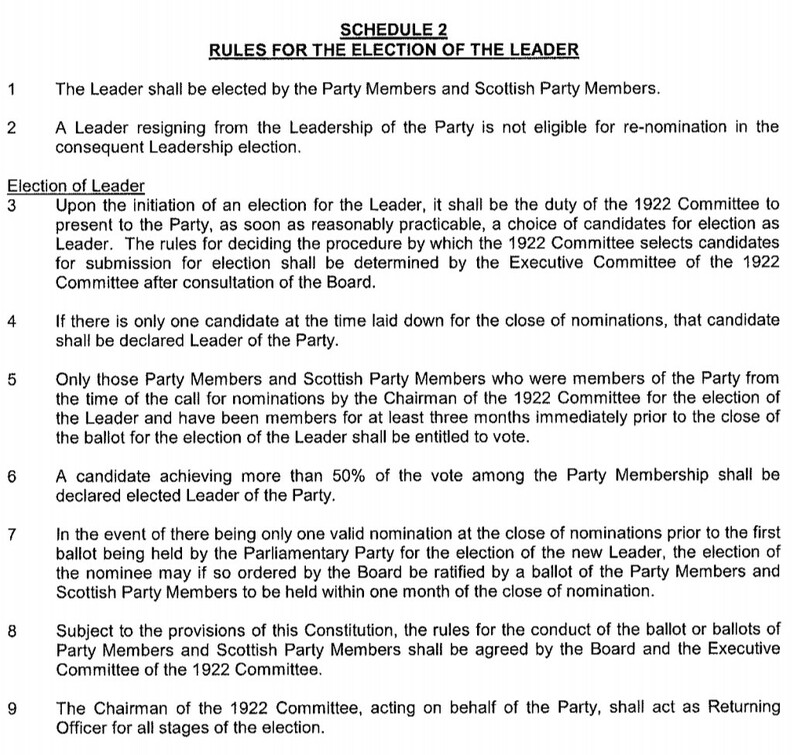 You have to be a member at the time of the “call for nominations” (and at the time of writing there has been none) and you have to have been a member for three months at the close of the ballot (presumably of Party Members) for the leadership. So, unless the contest is over within three months (and remember: it has yet to even start) new members joining now will have a right to vote. Joining costs £25 – or a mere £5 if you are under 23. This compares with the last Labour leadership election where becoming a “Registered Supporter” cost £25 whatever your age. Most importantly of all, you will have a high degree of influence. The Conservative Party membership is low. 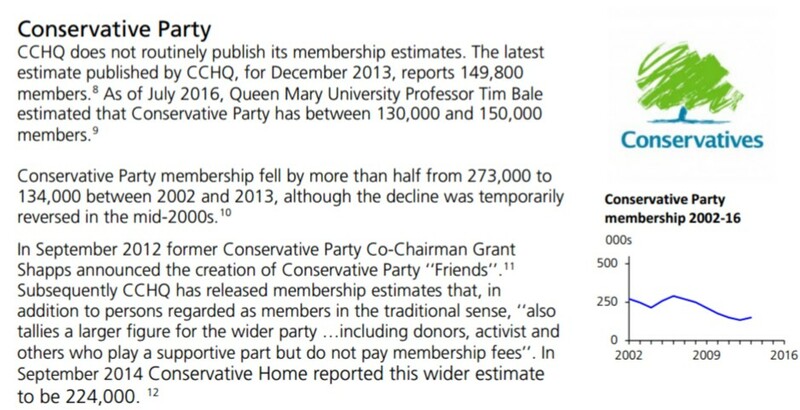 This recent estimate from Professor Tim Bale (published by the House of Commons Library) gives a figure of between 130,000 and 150,000. And, of course, turnout will be less than 100%. In the 2016 Labour Leadership election, for example, it was 78% but that may, given the febrile atmosphere, have been artificially high. In 2010 it was 72%. 72% of the middle figure of 140,000 is 101,000 so the winning candidate would need only 51,000 (rounding to the nearest thousand) votes. It is perfectly possible that just a few thousand could tip the balance. Well, Rule 17.7 gives the Board of the Party an absolute discretion to cancel or refuse your membership. But nothing ventured nothing gained, you may think. And on a refusal – and I think likely a cancellation – you would get your money back. 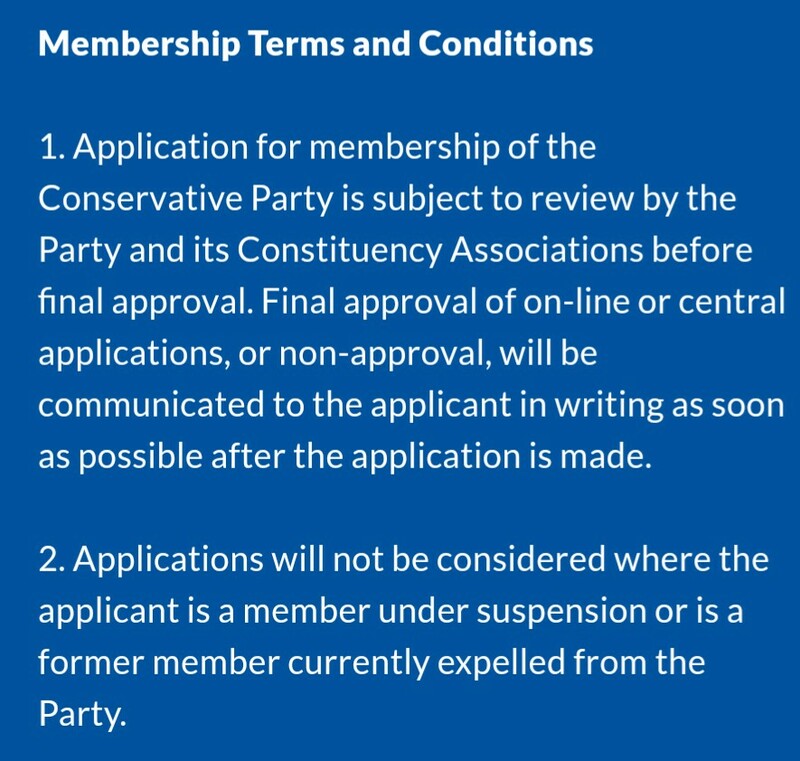 Membership is open to those who share the Conservative Party’s objects and values (see Clause 3 of the Rules). But they are (so far as I can see) nowhere stated. You would – at least if the Labour Party found out (often they don’t) – lose any membership of the Labour Party (see Chapter 2 Clause 1.4.B). 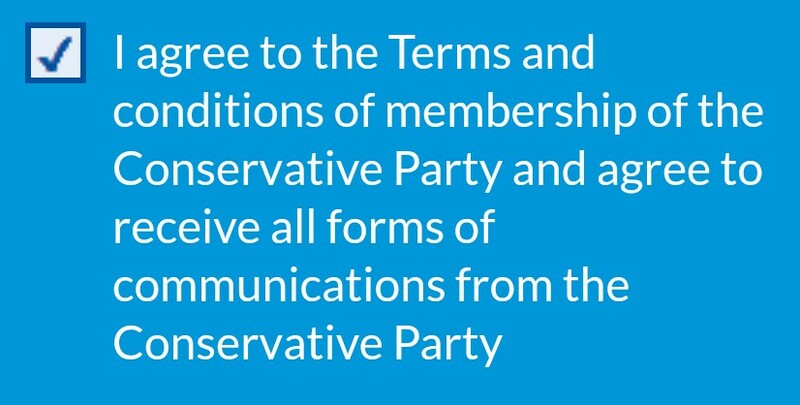 And you have to agree to the Terms and Conditions of membership of the Conservative Party. But they are relatively modest. If you want to choose the next Prime Minister – albeit from a shortlist – and influence Brexit… perhaps you should join the Conservative Party. Salve your conscience. Join, vote and then don’t renew your membership. Gaining power but having to live with yourself for ever, knowing what you’d done. Rather a Faustian bargain. Anyone joining the Conservative party. Not sure my conscience would stretch to it. Jolyon – Conservatives like me would welcome some of the readers of your blog. Those of my ilk believe that we need more public borrowing at this time of low-interest rates to tackle the problems of the poor and disenfranchised. We want fracking to tackle energy security and create high-value jobs in manufacturing industries – we will get that through working with the DUP and Northern Ireland could become a new energy Saudi Arabia for the UK (with rather better human rights). We want controls over uncontrolled immigration from the EU and wish to see a cross-party team in Parliament establishing a common position on immigration to put to the EU27 in our Brexit negotiations. There are also other areas of potential cross-party approaches to the EU27 in Brexit negotiations. We want to have a strong economy so that we can invest in schools, training, apprenticeships and the NHS – and that will require that the UK makes the best use of its forthcoming export opportunities via a revised Board of Trade, particularly in the services sectors. We want a well funded military so that Britain can protect itself and its allies. We also want reform of the legal profession so that proof of misconduct in legal disciplinary hearings is on the basis of ‘the balance of probabilities’ rather than ‘beyond reasonable doubt’. For my part, I also want to see the abolition of legal professional privilege in civil cases to simplify and speed up disclosure proceedings and reduce their costs. Mrs May will not be our PM at the next election. I anticipate that rather than seeing a quick change to one of the ‘Big Beasts’ you have listed, the party will engage in a ‘full and frank exchange of views’ around the time of the party conference and new potential leaders will manifest themselves around the turn of the year. I’m tempted, but what if the choice put to the Members is Gove vs Fox??? Thanks Jo, but no thanks – it would be a step too far. There are signs that the political parties are thinking about talking to each other about what to do about Brexit. Ever the optimist, I’m hoping that this is the first step in the process of abandoning Brexit altogether. Since the referendum, it has become clear to nearly everyone that the best possible deal for Britain is to retain full EU membership. It’s just taking an awful long time for some people to admit it. When you have the courage, as I do, to put your name to what you write I will answer your points. Until then I will treat them as what they appear to be – the bitter slanders of an anonymous troll. You describe Ruth Davidson as ‘the public’s choice’ but don’t go on to mention that as she doesn’t sit in the UK Parliament, she isn’t (I don’t think) eligible to stand. Being a labour party member I am quite pleased about that as she is a formidable politician that would be capable of hoovering up many potential labour voters. Political party membership is not tribal – although some misguided people seem to take it that way. People in the course of their lives should revise their views as the facts and circumstances change. Many members of the House have moved from one party to another in the course of their political lives. Many left-wing journalists have become right-wing as they have studied and considered matters more deeply. Melanie Phillips is a good example of such a change of viewpoint. Michael White on the Guardian has developed his views over time. Peter Oborne of the Spectator is another example. It is called learning by experience. Jolyon is not for a moment suggesting the sabotaging of a possible Tory leadership election. He is proposing that someone who may currently be a Labour supporter renounces their current membership of the Labour Party and becomes a member of the Conservative Party. He will thus be allowed to participate in the selection of a new Tory leader when the time comes. But by going under ‘deep cover’ this recruit may well find himself in discussions with people like me. He will have to argue and justify his political positions. I have complete confidence that if the person is even half-way sane he will end up with ‘Stockholm Syndrome’. So we welcome any of Jolyon’s web followers joining us in the Tory Party. We will happily take your £25 annual subscription and take the risk of subversion. This is interesting, particularly your indication that membership if the Conservative Party is possibly rhe most effective way for a pleb like me to influence my nation’s direction at this quite critical juncture. I would ask, however, in light of John McDonnell’s quite unambiguous comments on exiying the single market, whether you npw b elieve that influence can ONLY be achieved through the Conservative Party amd there is no point going anywhere near the Labour Party? Furthermore, of serious debate can only be had through the Conservatives, have you considered following your own suggestion?